﻿Welcome to the website of the RCES Library Media Center. We hope the pages here will help you to locate information that you need! You may use the link below to take you to the RCES Library Catalog. This will allow you to search for books within the RCES library. 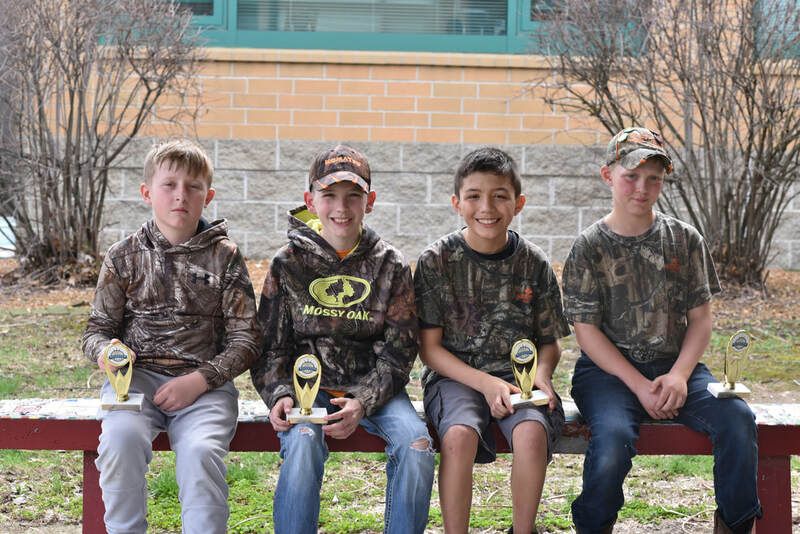 We had an outstanding tournament this year and would like to thank all of our participants, parents and teachers. Congratulations to this year's winners! 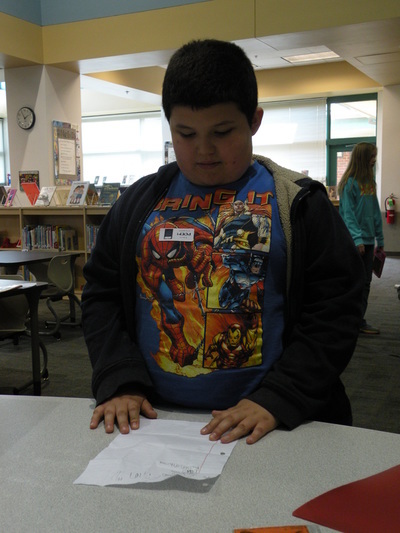 Members of our RCES Library Council asked several students to share their favorite picture book in November. Check out some of their responses below! The RCES Circus Book Fair is Coming! 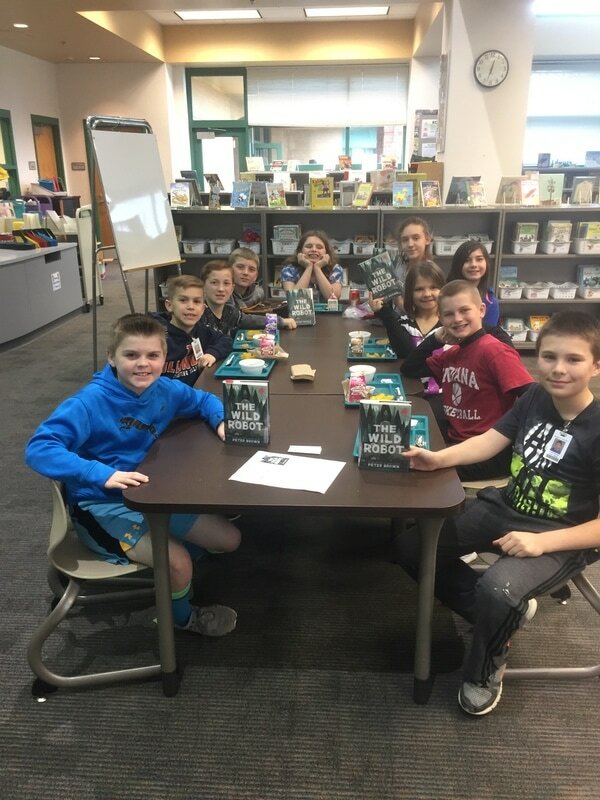 Every Tuesday morning before school we have an awesome volunteer who delivers a book talk to students in grades 3 - 5 about one of our books from the 2018 Bluestem List. RCES students and staff had a wonderful time on October 11-12 while we hosted Author/Illustrator David Biedrzycki. David did a fabulous job teaching us and entertaining us while he shared about his writing and artwork. Josh Funk Visits RCES on his Stinky Stench Tour! Many of our RCES students have gotten to know Josh Funk through skype visits and through his fabulous books. Lady Pancake and Sir French Toast was voted as the RCES Book of the year in 2016. We will thrilled when Josh was able to make our school a part of his tour for The Case of the Stinky Stench! We had a wonderful visit with Author Sarah Weeks at our school this week! Thank you to our RCES PTO for making this awesome experience possible for our students. 2017 Battle of the Books - The Winners! 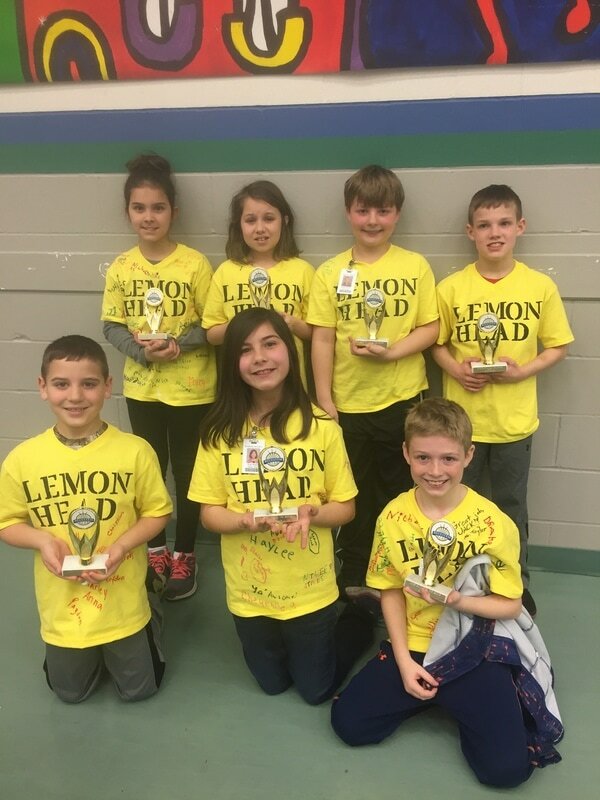 Congratulations to the following teams who won their grade level competitions: FBI: Friends with Book Intelligence, 3rd grade, 3rd place; Bluestem Battling Lemonheads, 4th grade, 2nd place, and Reading Rebels, 5th grade, 1st place. Check Out These Doors Inspired by Books! RCES classrooms were invited to use their doors to share a book (or books) they loved. All participating classes were entered in a drawing for $100 to spend at the Happy Camper Book Fair! Family Reading Night was held at RCES on November 17 and was a huge success with many visitors, fun activities, and lots of books! Mrs. Bettis and her first grade class joined us in the library on October 4 as we skyped with Author Laura Murray. Ms. Murray is the author of the famous Gingerbread Man books. She read her newest book, The Gingerbread Man Loose at the Zoo, to the students and answered several of their questions. Thank you to everyone who visited and made purchases at our Fall Book Fair. This fair allowed us to provide many books for our classrooms throughout our school! We have had many students ask us about the 2017 Bluestem list. 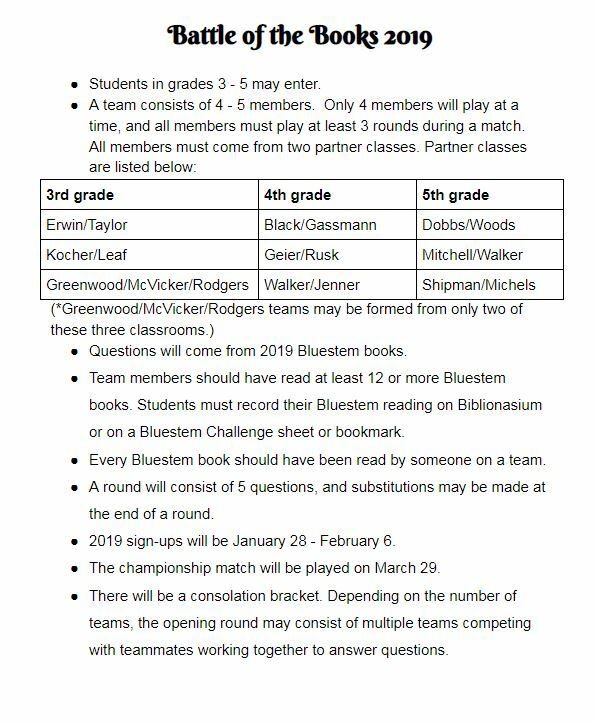 I am posting a copy of next year's Bluestem Challenge below for those who are interested. 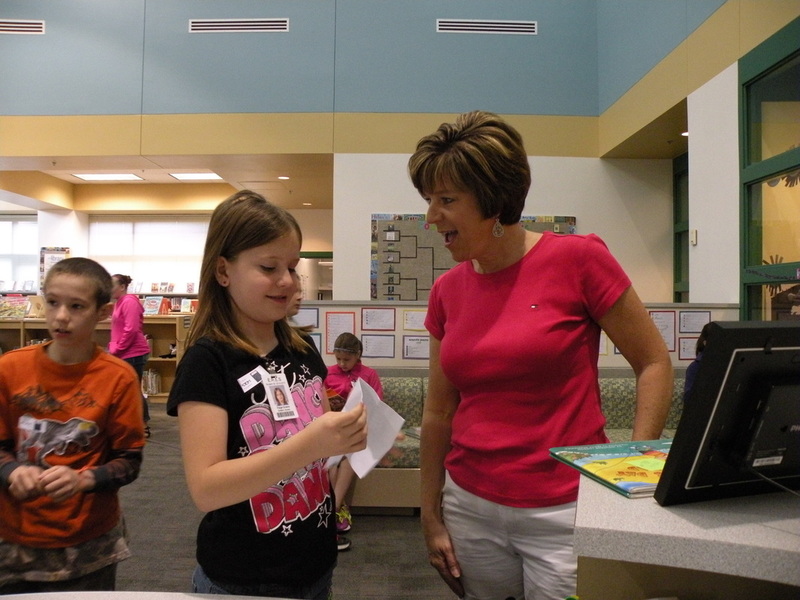 Our spring book fair was held April 22 - 27. The theme was "Take Me Out to the Book Fair". Over seventy dollars was collected by people who donated their book fair change, and it was used to buy books for The Big Blue Book Bus that will transport books to Richland County students during the summer months. 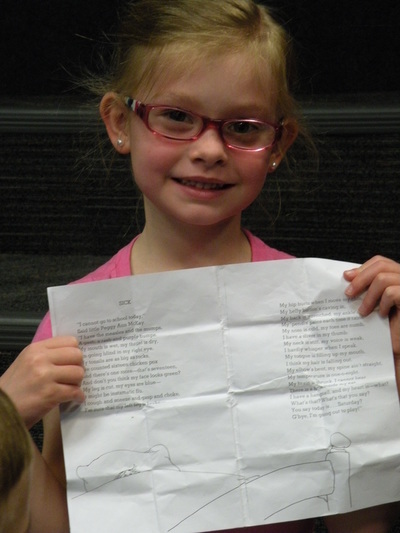 Poem in Your Pocket Day was celebrated at RCES during the week of April 18. 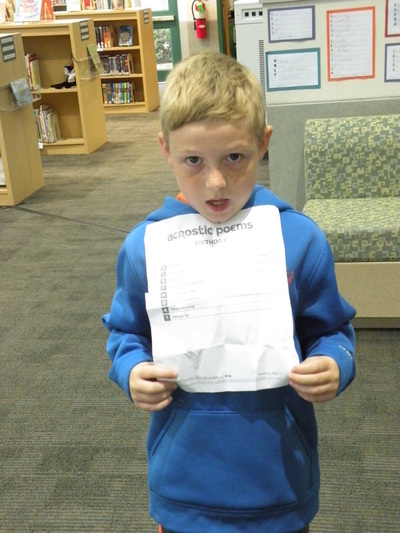 Some of the students who shared poems with others in the library are shown below. 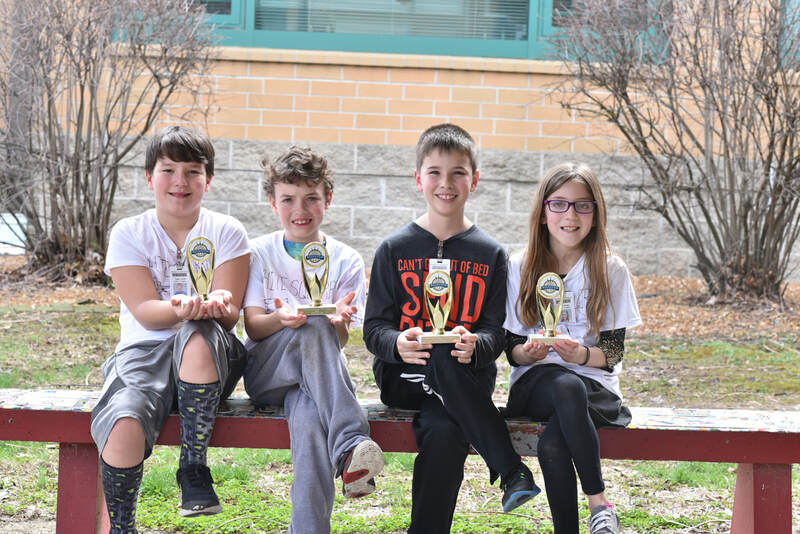 We completed our 4th Annual Battle of the Books Competition on Wednesday, March 23. After defeating the 4th grade winners, the Bluestem Busters, the top 3rd grade team, the Bluestem Destroyers, went on to challenge the fifth grade champs, Beast Mode. After a hard fought match, Beast Mode came out on top. 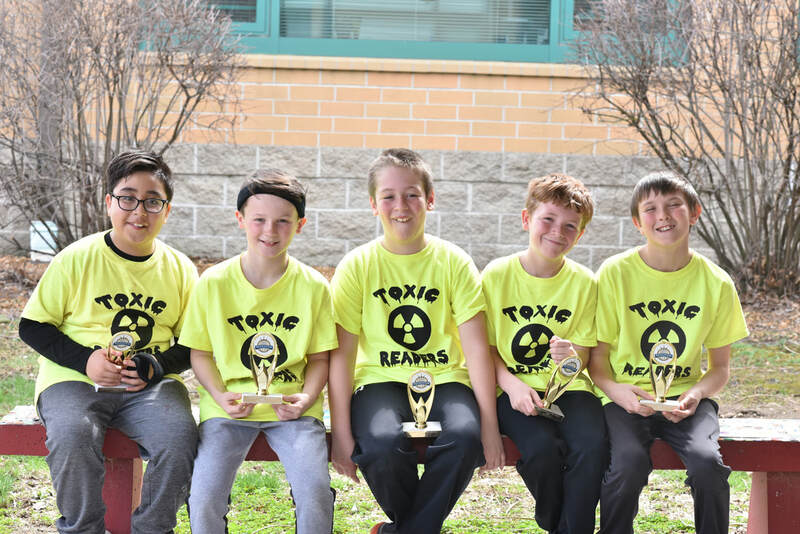 After that, our RCES champions faced the teachers' team, the Beast Busters. For the first time since we have held the Battles, the teachers defeated the students. Thank you to everyone who competed! Several RCES classes celebrated World Read Aloud Day, which was February 24, by skyping with some Kid Lit celebrities! Mr. Schu, who is the Scholastic Ambassador for School Libraries, read Ballet Cat: The Totally Secret Secret by Bob Shea with Mrs. Simpson to Ms. Scherer's first graders, and he shared a few of his favorite books. Josh Funk, the author of an RCES favorite, Lady Pancake & Sir French Toast, shared an early look at his upcoming book, Pirasaurs, which will be available in August. Ms. Rusk's third graders listened to Julie Falatko read her book, Snappsy the Alligator (Did Not Ask to Be in This Book! ), and Deborah Freedman read Blue Chicken to Ms. Hahn's second graders. 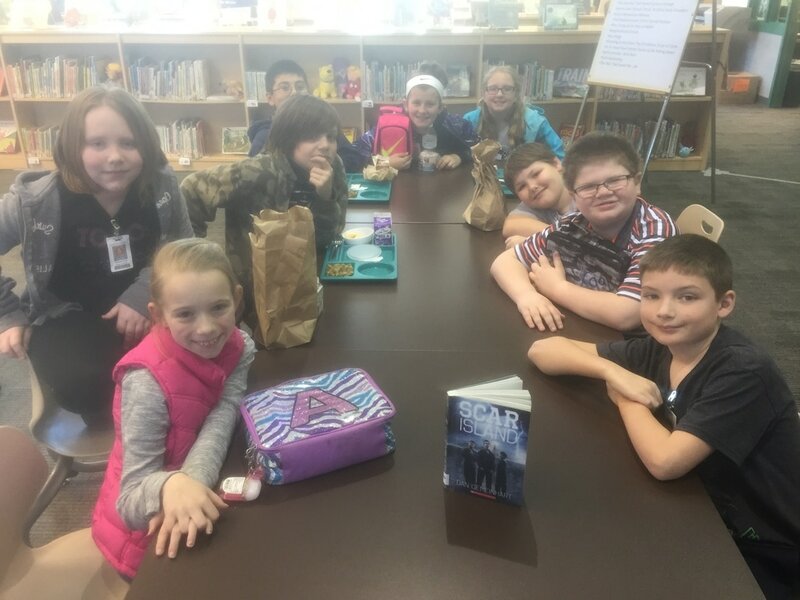 After an early dismissal due to snowy weather, Tricia Springstubb graciously rescheduled her time wiht Mrs. Jenner's fourth grade class. She read a chapter from one of her books and told about becoming a writer. All of our Skype partners answered questions from our students. We appreciate all of them for helping us to celebrate books on World Read Aloud Day! 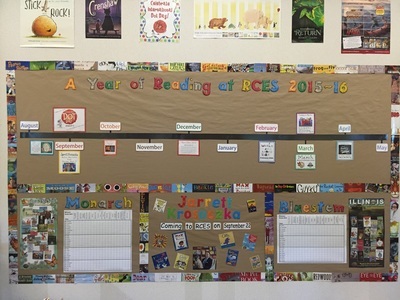 2016 Mock Newbery Club Members Recommend Their Favorite Books! Congratulations to Aliyah Tracy, a 4th grader in Mrs. Brooks's class, for winning our first ever Mock Caldecott Medal Design Contest. Aliyah's medal was placed on the RCES Mock Caldecott winner, Finding Winnie, The True Story of the World's Most Famous Bear, by Lindsay Mattick and illustrated by Sophie Blackall. 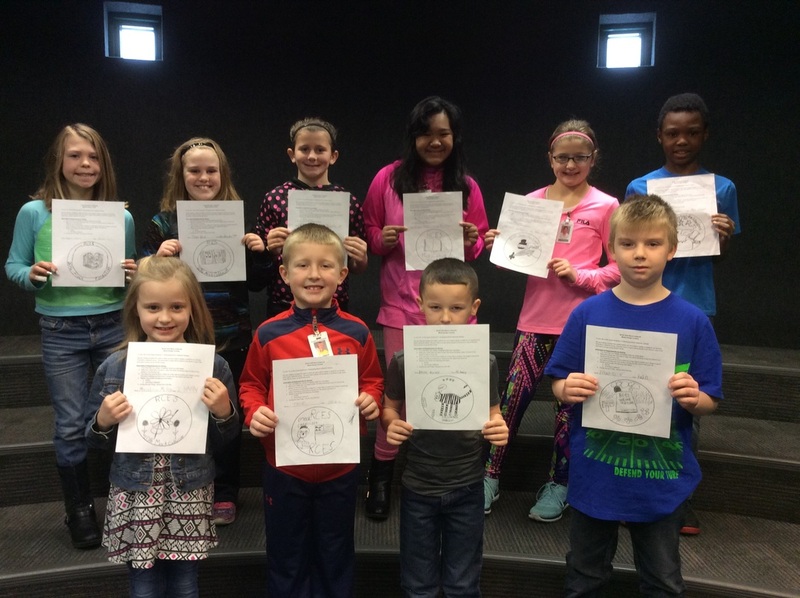 The RCES student choice for this year's Caldecott also received the actual Caldecott Medal on Monday, January 11. 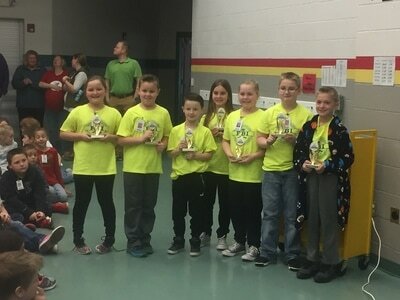 Finalists in the Medal Design Competition included the following students: (Front row - 2nd graders) Meadow Miller, Jace Paddock, Bryson Nuttall, & Ethan McCoy. (Back row - 4th & 5th graders) Allyson Mitchell, Claire Vaal, Aliyah Tracy, Krishna Malco, Jorri VanDyke, & Saul Jones. All of the entries by these finalists will be displayed in the library hallway at RCES. 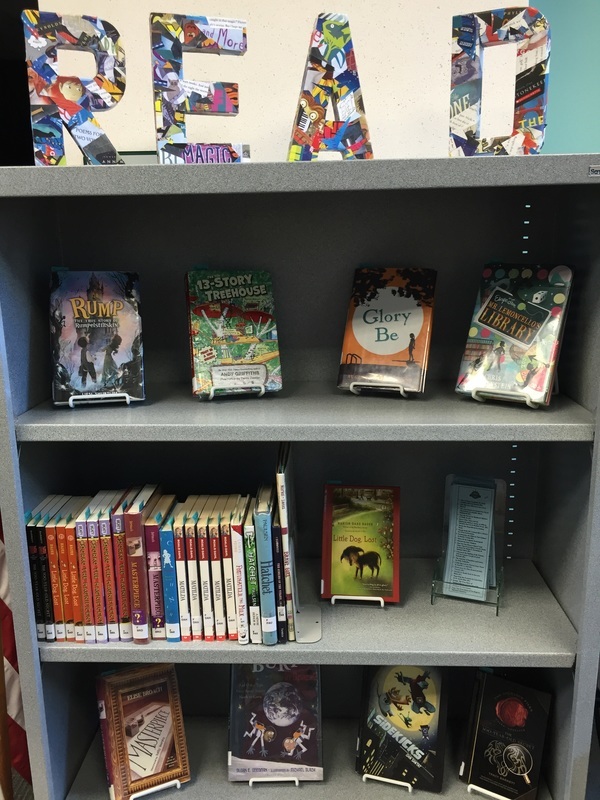 Many of our fiction books in the RCES library have been rearranged according to their genres. 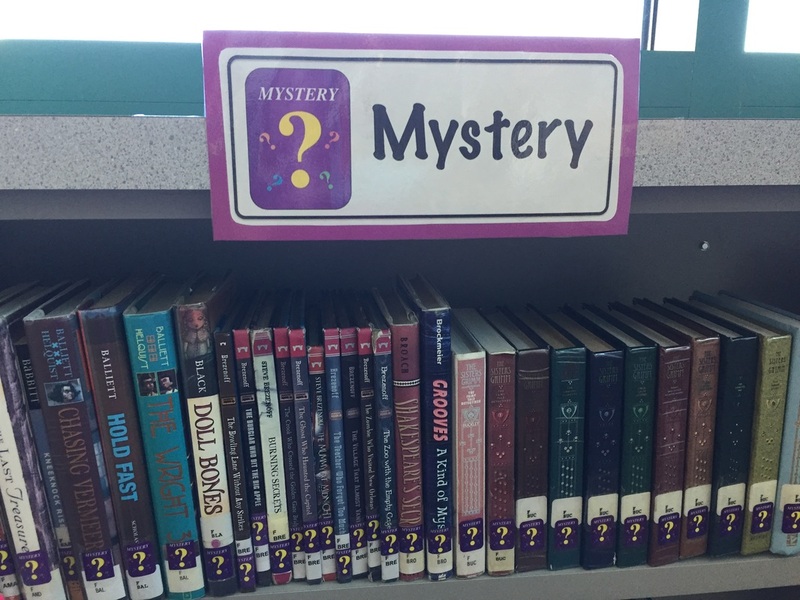 Now students may search for books according to the type of books they may want to read. 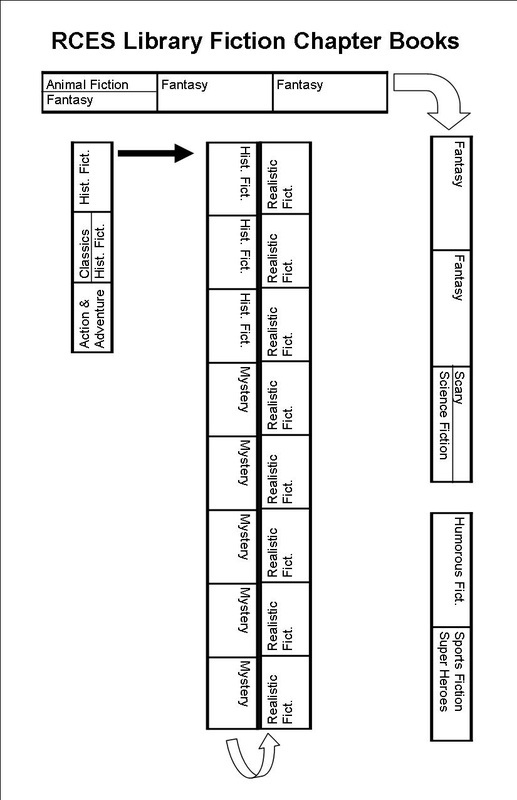 The following sections have been formed. Many RCES students and families visited the school on Tuesday, November 17 for Family Reading Night. Several students advertised their favorite books and dressed as book characters. Families were able to hear local heroes read stories, create with LEGOs, play Monarch Book Bingo, and enjoy delicious food. Thank you to all who participated and helped to make the evening a success! The RCES Library is now hosting our Third Annual Dress Your Pumpkin Like a Book Character event. Classes, students, or staff members may bring a pumpkin beginning on October 13 to display in the library. Please bring a copy of the book's cover to display with your pumpkin. We will continue the display through October 30, and we will be sending them home then. Feel free to stop by the library to view all of our characters! RCES Book Fair Was a Monstrous Success! 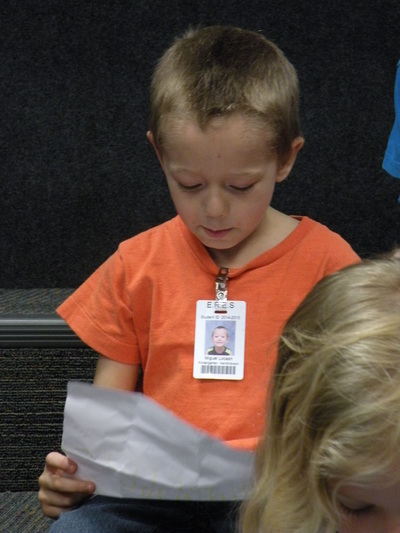 RCES held its fall book fair October 5 - 9 in the library. The sales totaled over $19,000, and that allowed teachers to get books for the classrooms and the library. Thank you to everyone who purchased books and to the many parents who helped work at the book fair! RCES students and staff enjoyed presentations by Jarrett J. Krosoczka on September 22. Mr. Krosoczka read a few of his stories and told about his experiences as he became a published author and illustrator. Students were very excited to see him draw some our their favorite characters! He also told students about writing as a child and encouraged them to be creative and make their own books. Jarrett J. Krosoczka Visit is Coming Up! Author/Illustrator Jarrett J. Krosoczka will be visiting RCES on September 22! He will be presenting to each grade during that day. If your child has purchased a book to be autographed by Mr. Krosoczka, he will be signing books while he is here. The books will be sent home with your child as quickly as we can distribute them, either on September 22 or 23. Below is the book trailer for his newest book, which just hit bookstores on Tuesday, September 8. Our RCES Book Fair is quickly approaching! It will be held in the library this year, during the week of October 5 - 9. 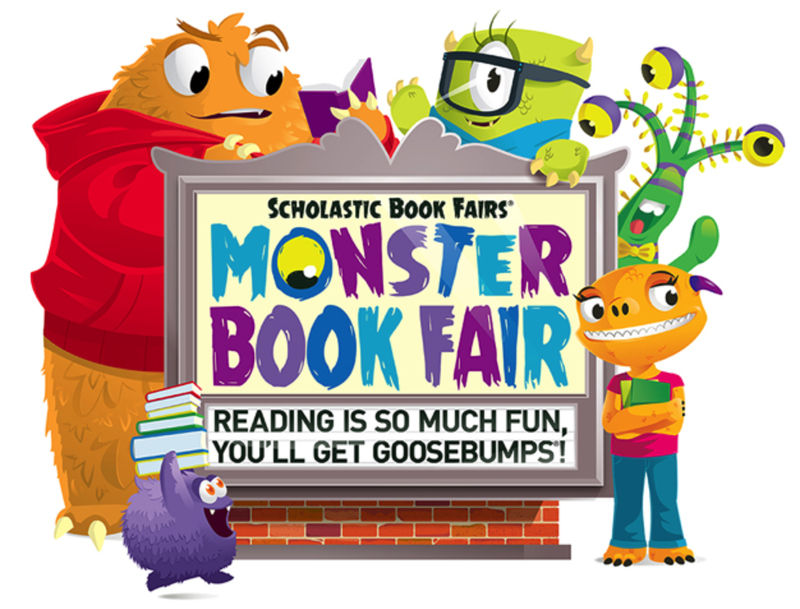 This will be a Monster Book Fair! 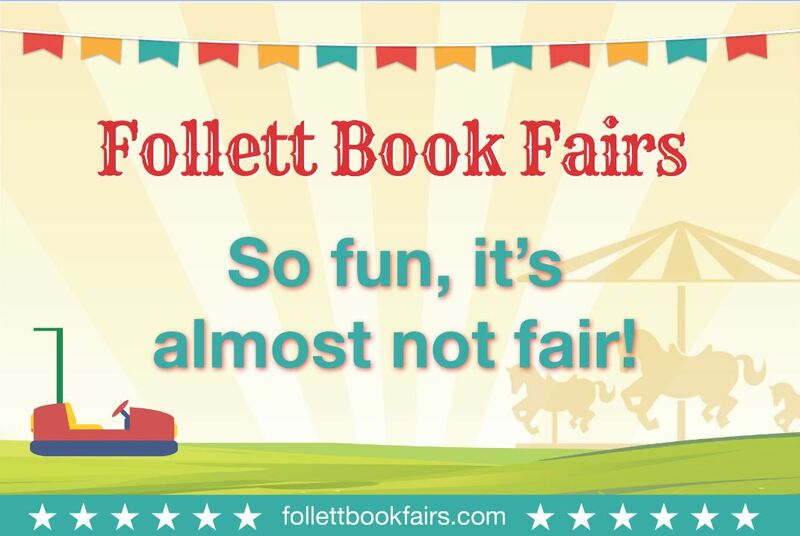 Students in each class will have a time during school to visit the book fair and another time to purchase books. Don't miss our Monster Book Bash on Tuesday evening from 5:30 - 7:00. There will be a monster photo booth for your child (& you if you'd like) to be photographed! You will also be able to order books online through our school's online book fair page. Check it out! We have have lots of fun celebrating the book release of Lady Pancake and Sir French Toast with Author Josh Funk this week. Our students have enjoyed hearing the story, watching Josh's video message, voting for the predicted winner, and the grand finale, pancakes and French toast for lunch on Friday! RCES is sending a huge thank you to Sterling Publishing Company and Author Josh Funk for sending us this early copy of Josh's first published book, Lady Pancake and Sir French Toast. 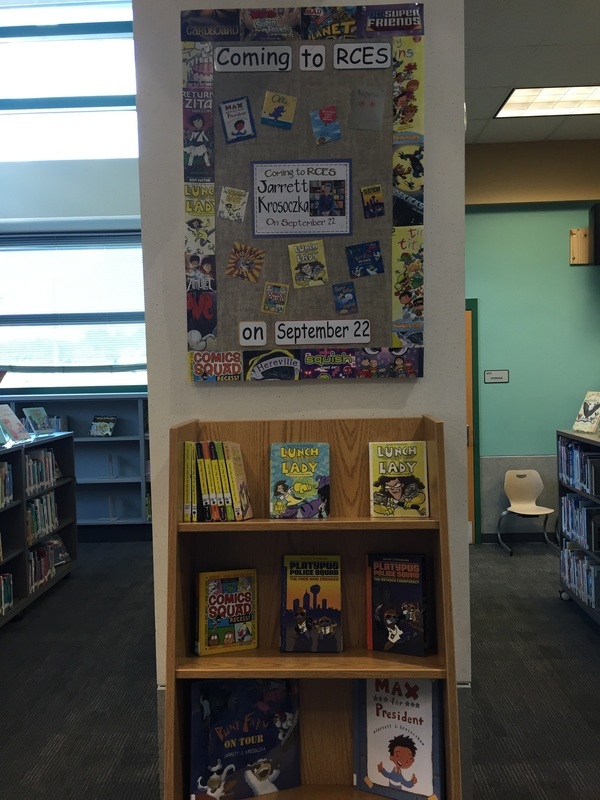 Students in all grades were very excited to see it in our library. (I was barely able to keep it so that I can read it to students next week!) A few students did manage to swipe it for a few minutes to find out who wins the big race, but they have PROMISED not to tell! We look forward to having a great time with it next week and we celebrate along with Josh, the illustrator Brendan Kearney, and Sterling Publishing Company. Don't forget - our cooks will be serving pancakes and French toast next Friday, September 4! Students in grades 1 - 5 have enjoyed hearing the story The Day the Crayons Came Home this week. The sequel to the popular The Day the Crayons Quit by Drew Daywalt and Oliver Jeffers, this book tells the story of Duncan and his crayons (whether lost, forgotten, or abandoned) who are ready to return home. The crayons share their stories through a set of hilarious postcards. We have a line of students who are ready to check this one out! 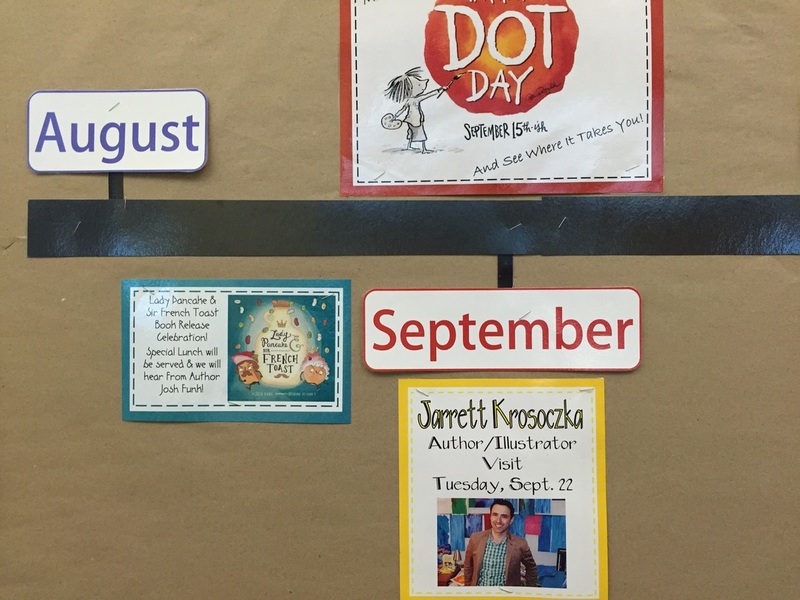 Jarrett J. Krosoczka to Visit RCES! New (& used) books - As usual, we have several new titles that were purchased over the summer and are just waiting for you to check out! 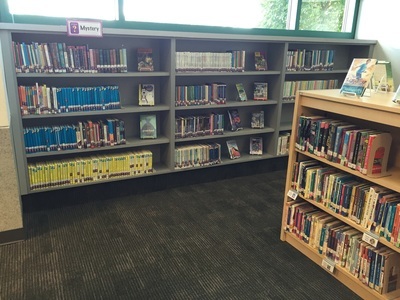 This year, we have many additional books that came from the West Richland Elementary School Library. New shelves - To make room for the new books, we had to add new shelves! You will find three new shelving areas in our library! New counter & barstools - We have a new area for you to work if you need to write, draw, take notes, etc. New arrangement - We are starting to arrange some of our books a little bit differently to make books easier for you to find. 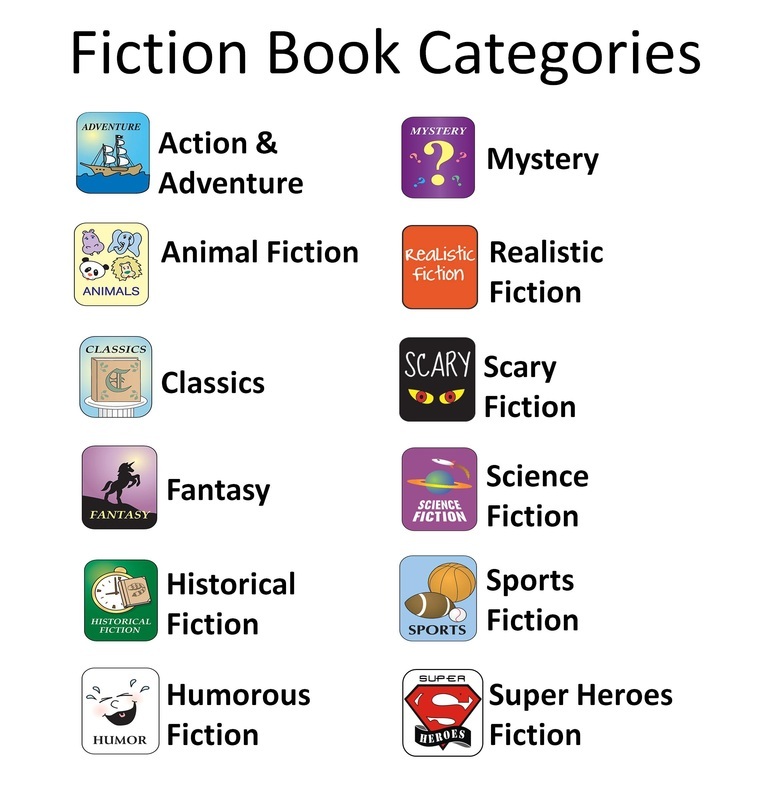 This is a work in progress, but right now you will find sections containing mysteries, easy readers, classics, fairy & folk tales, & graphic novels. 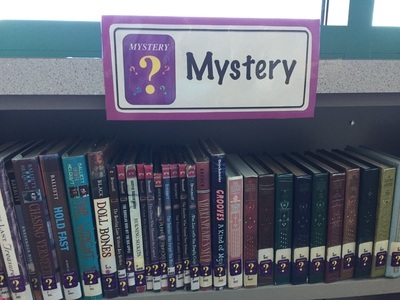 Our RCES Library will be open for checkouts on Thursdays from 1:00 - 2:00. We will begin on June 4 and do checkouts through July 23. If you would like to order books through Scholastic, you may do so using the link below and the following class code: LPCZK. The books can be picked up at the library. On April 30, we celebrated Poem in Your Pocket Day at ERES. 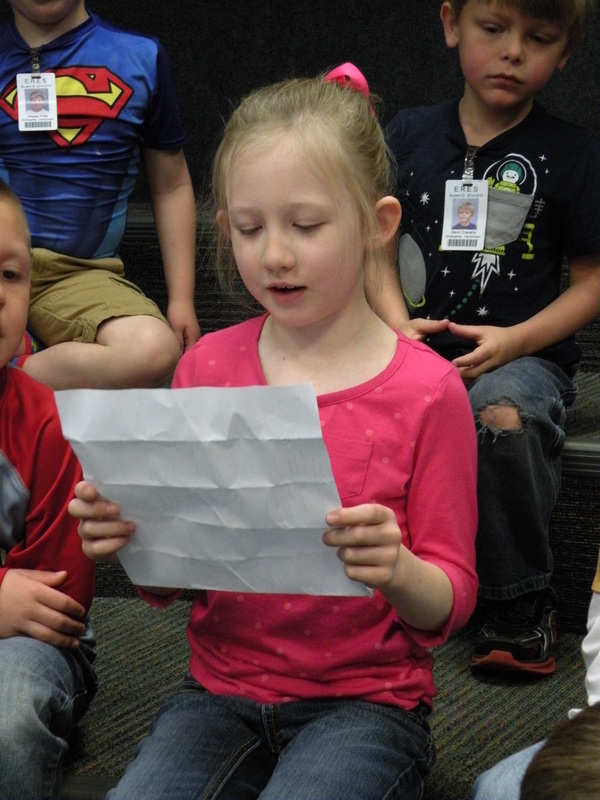 Many students and some of our teachers carried poems with them throughout the day and shared them with others. 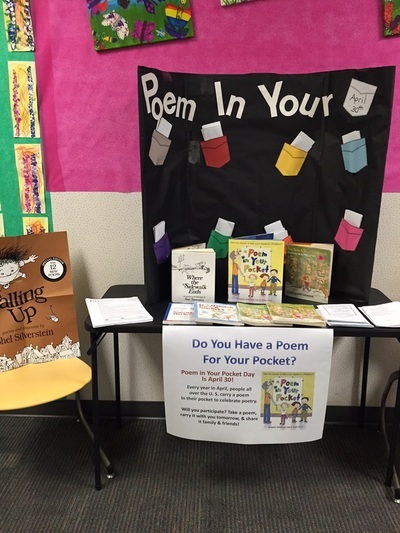 Check out the link below to learn more about Poem in Your Pocket Day. Author Aaron Reynolds returned to Olney on April 29 to present to Richland County students at ERES on Wednesday, April 29. 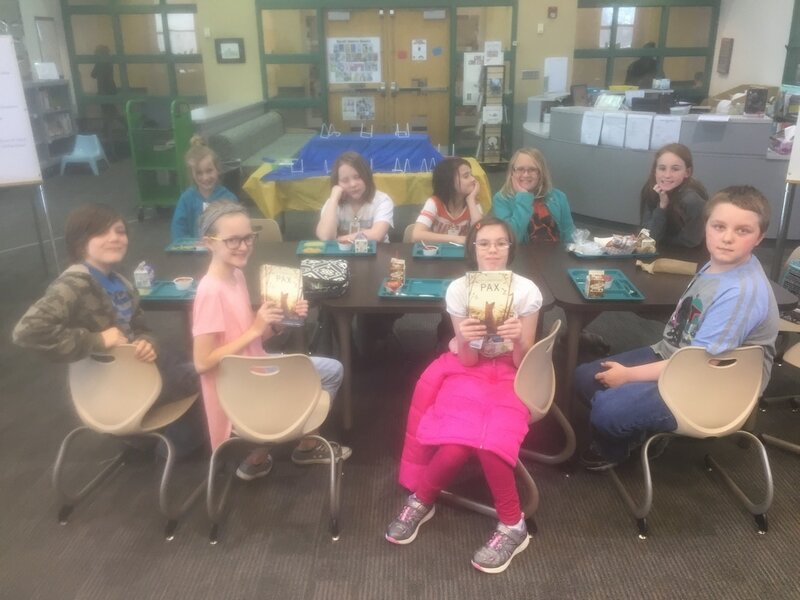 He presented the Joey Fly Creepy Crawly Crime Mystery Hour to 4th and 5th grade students that day, and then did his Carnivores presentation for students and parents that evening at the Family Reading Celebration.. Mr. Reynolds presented to ERMS students on Thrusday, April 30. 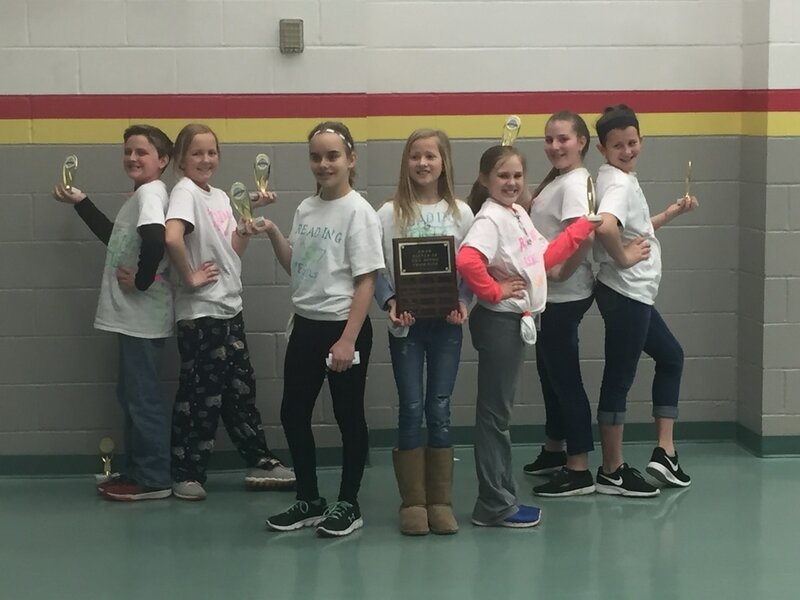 Congratulations to F.I.B., our 5th grade team who became our 2015 Battle of the Books Champions today! 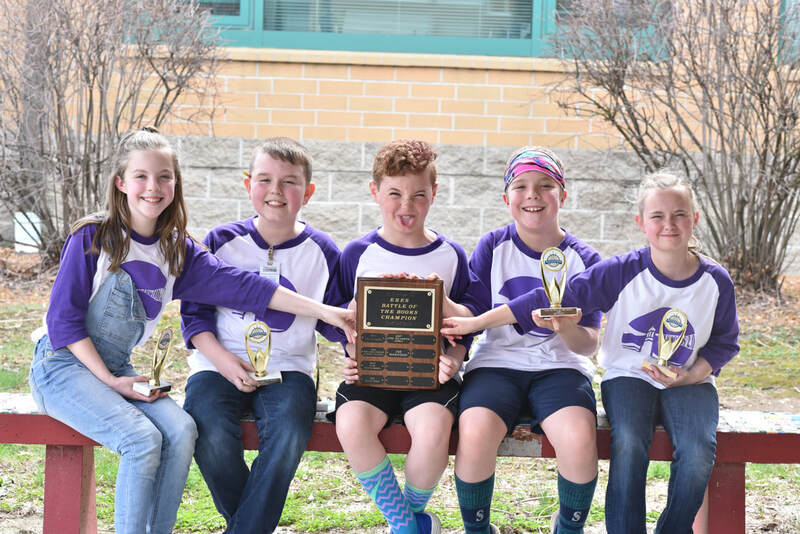 The Krazy Krew, third grade, received 2nd place in our Battle of the Books competition, and The Nerds, fourth grade, received 3rd place. Congratulations to these teams! We had 34 teams and 210 participants in grades 3 - 5 this year! Thank you to all of our teams for participating and reading! Thank you to our awesome teachers and parents for your support. You may find a picture of each team if you click on the pictures tab above. 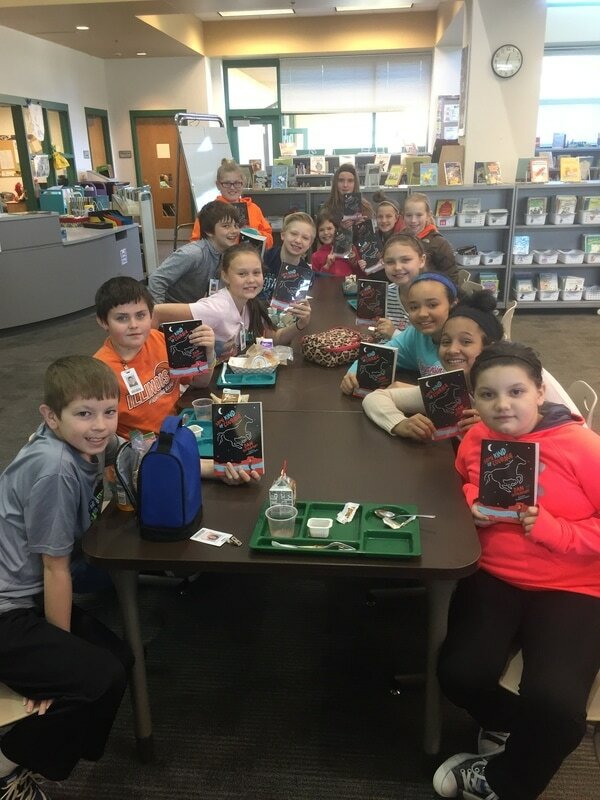 Ten members of the ERES Tiger Zone After-School Book Club have been reading Fish in a Tree by Lynda Mullaly Hunt, who is also the author of our One Book, One Community book One for the Murphys. Fish in a Tree tells the story of Ally, who is a sixth-grade student who is struggling in school, and feels that she is dumb. When a new teachers takes over in Ally's classroom, he begins to see Ally's strengths and her potential. The story reminds us that great minds do not all think alike. 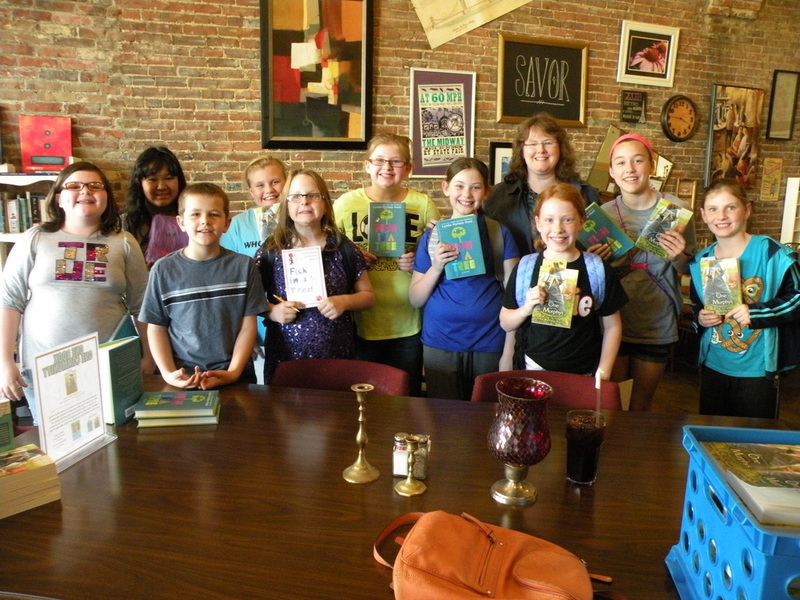 On March 31, the group had the privilege of meeting Ms. Hunt and getting their books and posters autographed. Imagine reading a book with the title of Naked! to a group of young children! As I am sure you can imagine, you are going to get lots of giggles. This was true with every class that heard the story Naked!, which was written by Michael Ian Black and illustrated by Debbie Ridpath Ohi. The delightful book shows a young toddler, who like many other toddlers, takes off running through the house without his clothes, with his mother following closely behind him! (Don't worry, the illustrations are done tastefully, not to mention that they are hilarious!) I cannot tell you how many requests we get for this book, but no group of students requested it more than those in Mrs. Shawver's 1st grade class. This made it easy for me to pick a group of students when I got the opportunity to skype with the illustrator, Debbie Ohi. We had a great time visiting with Ms. Ohi and watching her draw. 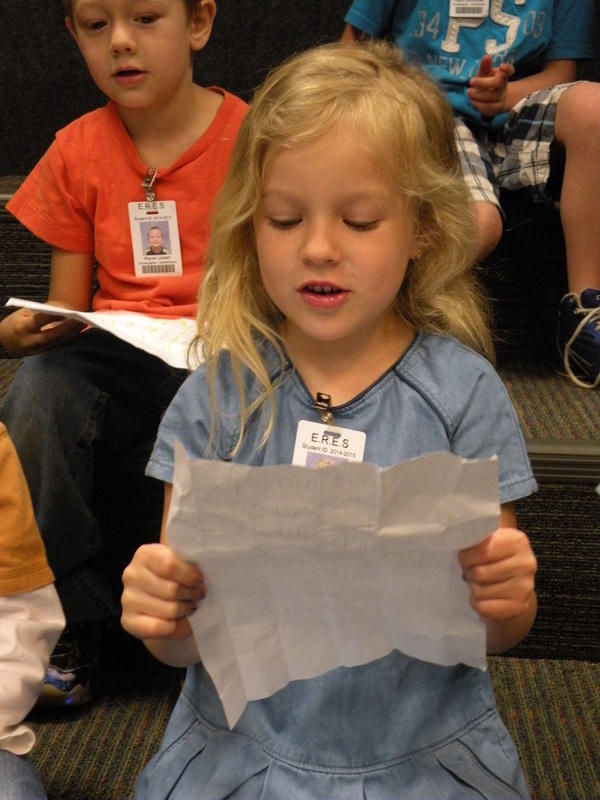 She also answered some questions from our first graders. This is an awesome way to be able to meet an author or illustrator without the high cost and travel time that is usually involved. Check out our pictures below! 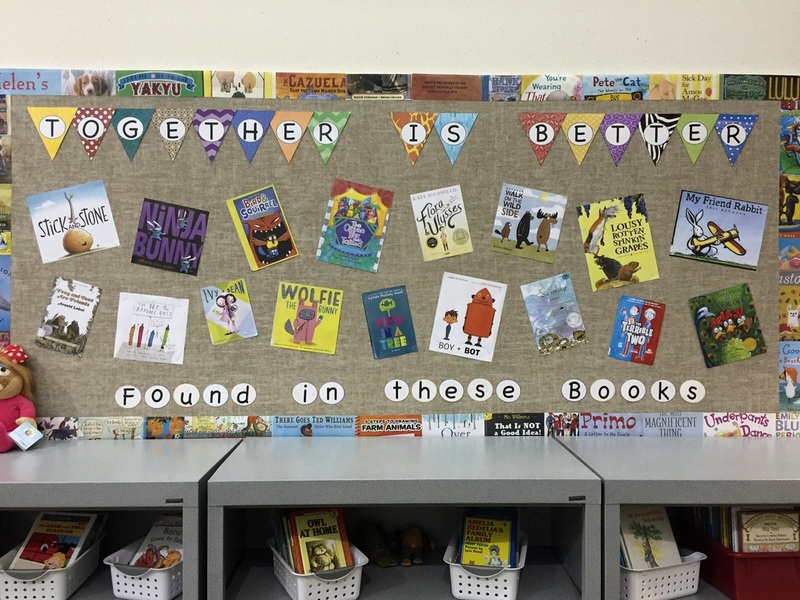 Honor Books: Louise Loves Art, The Adventures of Beekle: The Unimaginary Friend, & Have You Heard the Nesting Bird? Thank you to Ms. Hahn, Mrs. Smith, and Mr. Shipman (from WRES) for taking part in this project. We appreciate all of them for spending time reading books to their classes and allowing for time to score the books. I hope our students learned a great deal about the Caldecott Medal process. We will be anxious to see if any of our classrooms' winners will be among the Caldecott winners announced on Monday, February 2. 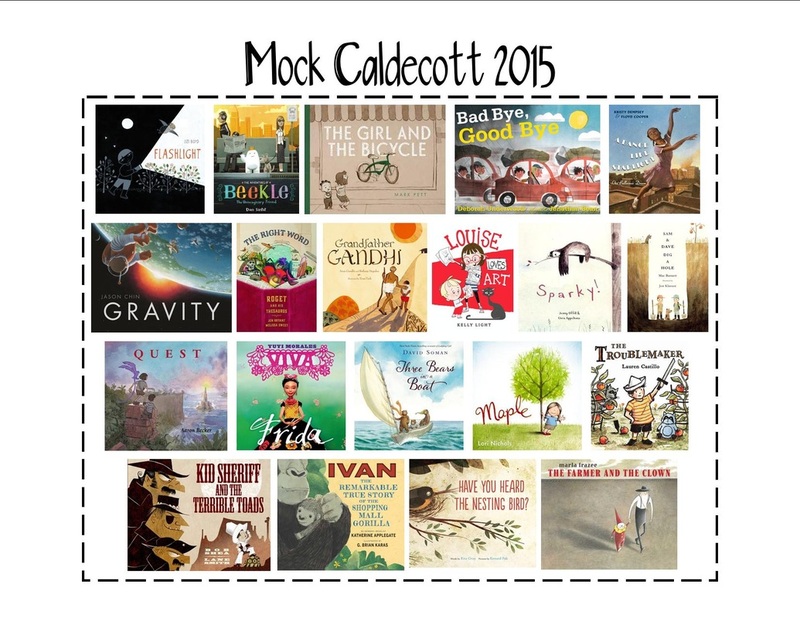 We are working with three classes in our ERES Library to evaluate 20 picture books in our Mock Caldecott. The Caldecott Medal is given each year (in late January or early February) to the artist of the most distinguished American picture book. Eligible books must have been published in the prior calendar year. Students in Mrs. Smith's 2nd grade class, Ms. Hahn's 2nd grade class, and Mr. Shipman's 3rd grade class (at West Richland Elementary School) will be acting as the Caldecott Committee and evaluating these books on the quality of the illustrations, how well the artist used a technique or style, and how well the illustrations portray the story. Students are rating each book with a score of 1, 2, or 3. After they rate the books, we figure up a class average, and will choose a top book along with two honor books. We will finish up in January, soon before the official Caldecott winner(s) will be announced on February 2nd. We are hoping that the winner will be on our list! Stay tuned for announcements on the ERES and WRES winners! ERES held Family Reading Night on November 18, where several students displayed their reading fair projects. Author Aaron Reynolds visited ERES on November 4th & 5th. His presentations were fantastic! 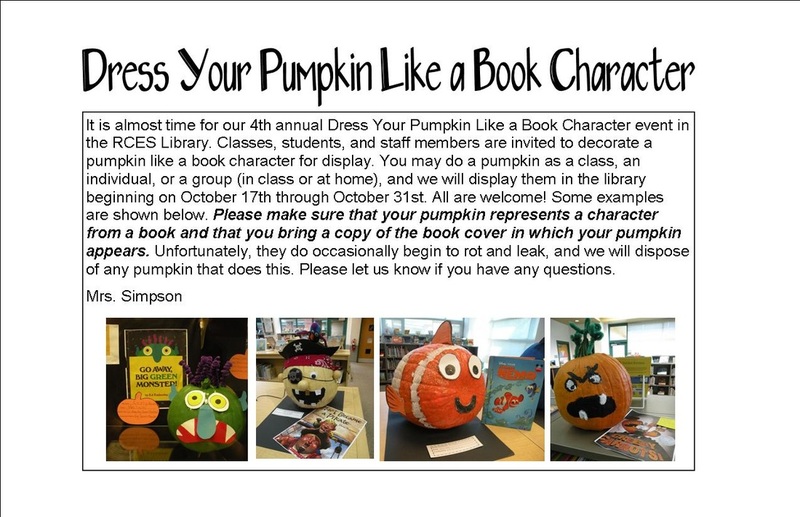 Once again the ERES Library is hosting our Dress Your Pumpkin Like a Book Character Event! Students and classes are invited to decorate a pumpkin like a character from a book. They may bring the pumpkin along with a copy of the book's cover, and we are displaying them in the library. Below are some pictures for you to enjoy, and feel free to visit the library to see the awesome pumpkins! 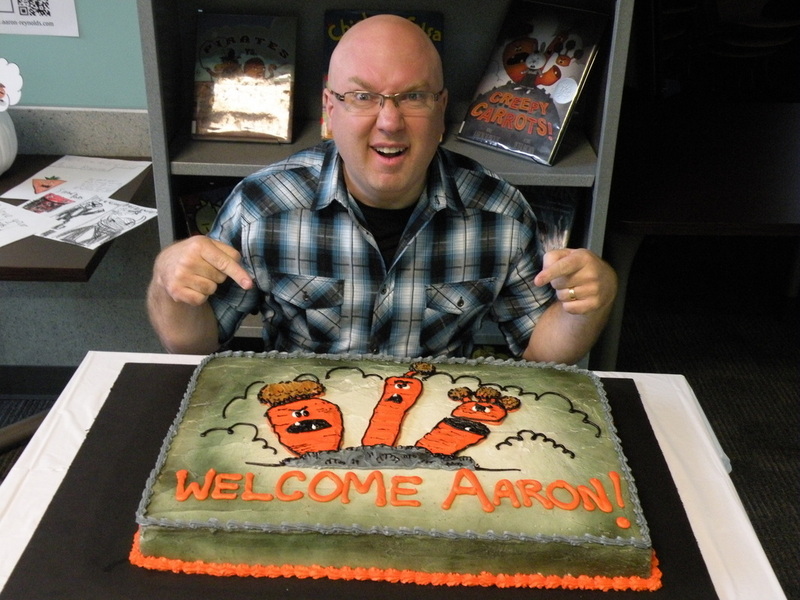 Aaron Reynolds, the author of Creepy Carrots (an ERES student favorite) and several other awesome books will visit ERES classes on November 4 - 5. We have some additional hardcover copies of Creepy Carrots available in the library for $10.00. (These are regularly priced $17.99.) Mr. Reynolds will autograph the books while he is here. 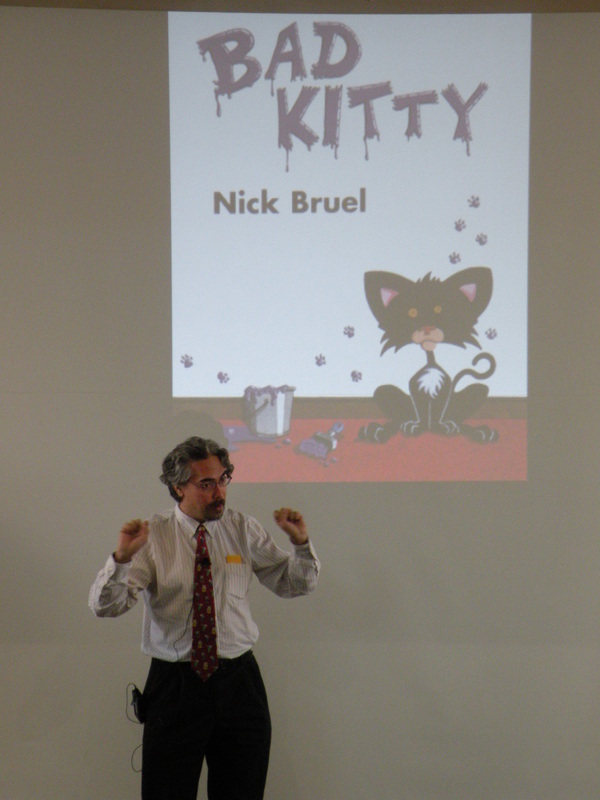 Nick Bruel, the author of the famous Bad Kitty books, visited ERES 1st & 2nd graders on Wednesday, October 8. 5. Niagara Falls, or Does It? All 5 of these titles are among the 2015 Bluestem nominees! Keep it up, ERES readers! We will host a summer book club for intermediate students this summer. We will meet on four Tuesday afternoons at Subfast/Pizzafast. Click on the link below to find out more information! Congratulations to the Fire-Breathing Rubber Duckies for winning the 2014 Battle of the Book competition. Thank you to all of those who participated. We are excited to have had 163 student participants on 26 teams. We will continue to hold matches on March 25 & 26, and the championship match will be held on March 28 at 9:30. The 2014 One Book selection for Olney has been announced and distributed. The Running Dream, by Wendelin Van Draanen, is the story of Jessica, who thinks her life is over when she loses a leg in a school bus accident. She faces so many challenges and has lost hope for many of her dreams. When she meets Rosa, who is confined to a wheelchair, she begins to see things differently. She starts to think she may even be able to run again, but suddenly that isn't enough. Jessica wants to help fulfill Rosa's dream too. We have checked out 37 copies of this book to 4th and 5th graders. Please join our community as we join to read this wonderful story! Due to sickness, we have had to postpone Author Candace Fleming's visit to ERES. She will now be coming on March 11 & 12. The books that students ordered have arrived, and they will still be autographed. Students will receive autographed books that they purchased during Ms. Fleming's visit. Author Candace Fleming will be visiting ERES on February 18 & 19. We have an order available for students who would like to purchase one of her books. Orders should be returned to ERES by Thursday, January 16. Ms. Fleming will autograph the books during her visit. The link for the order form is below. Thanks! Several members of the upcoming ERHS musical, You're a Good Man, Charlie Brown, came to visit the ERES Library on November 26. The characters introduced themselves, told about their production, answered questions, and signed autographs. The ERES students have been hearing Charlie Brown stories during library times. The musical will be presented at ERHS on December 6th & 7th at 6:30 PM and on December 8th at 2:00. 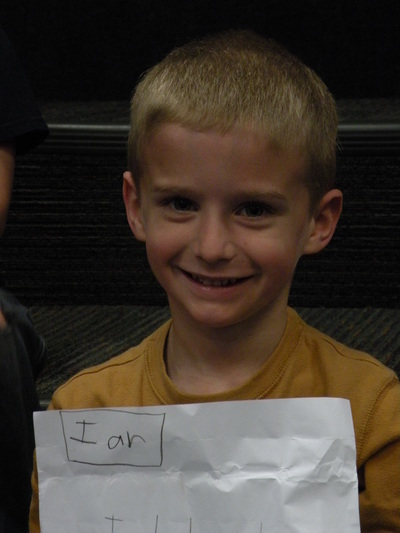 On Tuesday, November 19, ERES hosted a Family Reading Night for students and their parents. We were excited to have over 340 people in attendance. There were three different stations that participants could visit. They could do reading activities in the computer labs, look at books and read with their families in the library, or view reading fair projects in which students made displays of their favorite books in the dining hall. Charlie Brown and Snoopy (actor and actress from the upcoming ERHS musical, You're a Good Man, Charlie Brown, also visited and handed out bookmarks. 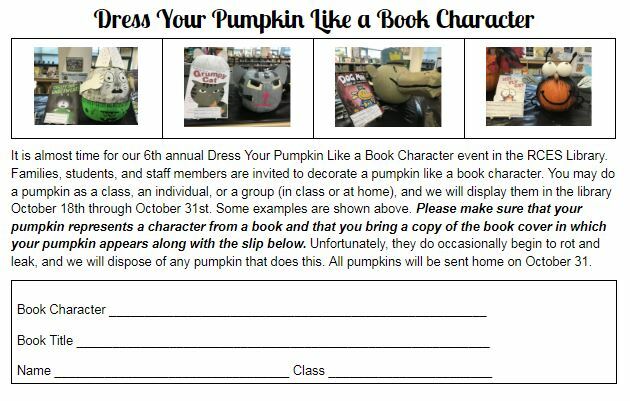 The ERES Library is hosting a "Dress Your Pumpkin Like a Book Character" during the month of October. Each class was invited to share a pumpkin that was decorated to represent a character from a book. Pumpkins are shown below. 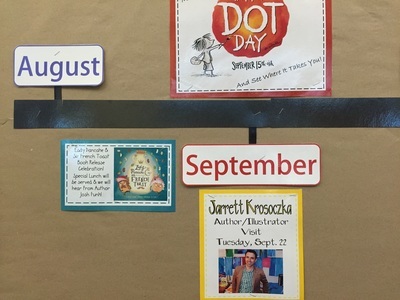 ERES celebrated Dot Day during the week of September 9 - 13. International Dot Day was inspired by the book The Dot, which was written by Peter H. Reynolds. It is a story that inspires readers to be creative, try new things, and be brave as they make their mark on the world! Our students heard the story, and many also heard the sequel, which is called Ish. Students created dots during their art classes, and many made one in the library. 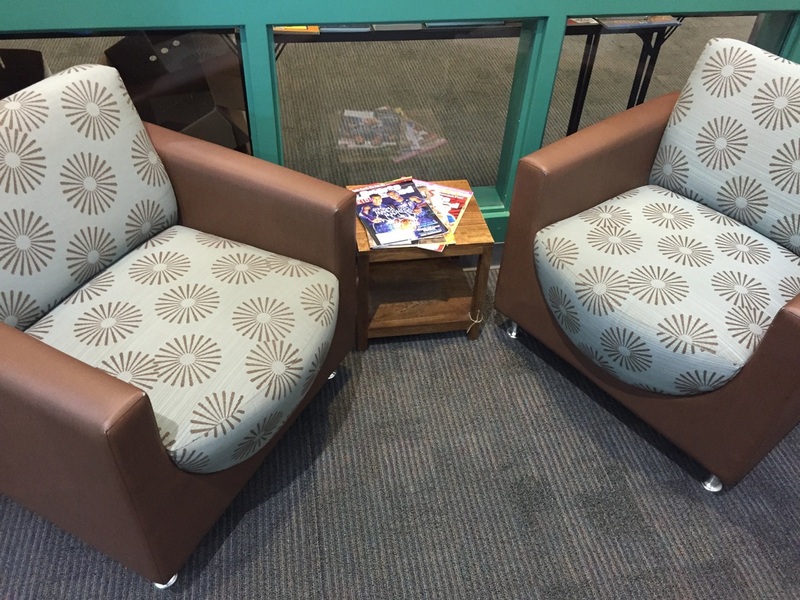 These have been displayed throughout the library hallway. Welcome back to school, ERES students! We are excited to be offering over 300 new books to you as we begin this 2013-14 school year!